We’ve previously introduced Cyan Design. Now let’s go a little deeper and take a look at just how beautiful these one-of-a-kind home furnishings and decorative accessories are! Each creation was designed, produced and curated for the eclectic home. 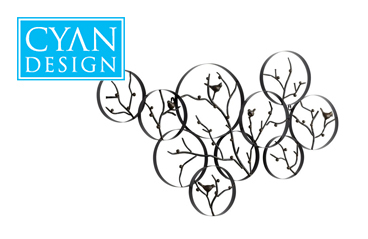 Each of the Cyan Design lighting options were designed with your unique style in mind. Each one crafted to be distinctive in your home. Intrigue guests upon opening the front door with the Abelle Chandelier, authentic looking with a finish of Persian White over wrought iron. Also great for large dining rooms, this piece is truly eye-catching! Introduce modern to any style and it still works with this unique sphere-design lighting option! 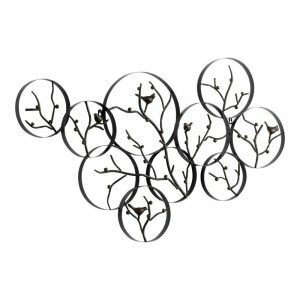 Add elegance and style to any room with this unique piece of wall art. I picture this one in an office, study, or sunroom! As a focal point or the starting point to your design scheme, this copper wall art would look great on large walls behind beds, sofas, and on mantels to name a few spots! Functional and unique, this wine holder is sure to have people asking where you found it! Use in the kitchen, dining room, or on either side of your home bar. The black bronze finish on this fireplace screen with compliment your color palette, adding a unique and decorative element to the space. Get a bit more decorative and elegant with the Crawford fireplace screen. With or without a fire burning, this piece is beautiful all on its own!